This paintbrush has 100% synthetic bristles and are new for 2018! The synthetic bristle allows for a smooth, even application having minimal to no brush strokes. 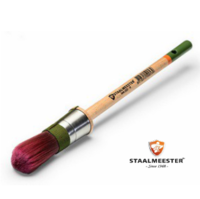 The brush features a traditional beechwood handle and a stainless steel ferrule making it stronger and more durable.